For questions, or to register to vote, please contact the Registrars of Voters, Dayna McDermott-Arriola (860-455-0160) or Mary Oliver (860-455-9031). You may also obtain and submit Voter Registration Forms in the Town Clerk's Office during Town Hall business hours, but you will not be registered to vote until your application has been processed and accepted by the Office of the Registrar of Voters. If you have just moved to town, will turn 18 by Election Day, or have recently become a U.S. Citizen, you can click on the Voter Registration Form link, print the Voter Registration Form, then bring it to Town Hall or mail it to: Registrars of Voters, P.O. Box 143, Hampton, CT 06247-0143. Election events are held in the Communtiy Room of the Hampton Town Office building on Route 97 (164 Main Street). Connecticut General Statutes stipulate that an ID be shown in order to vote, so please be sure to bring yours. Election events are noticed on the Town Bulletin Board outside Town Hall, on the Public Bulletin Board inside Town Hall, and in the Hampton Gazette and Willimantic Chronicle. On the day of an Election Event, "VOTE TODAY" signs are placed at Town Hall and various other locations around town. Absentee Ballots may be obtained from the Town Clerk in person during Town Hall business hours or by submitting an Absentee Ballot Application via fax to 860-455-0517. If you are unable to apply at Town Hall in person, please call one of the Registrars for assistance. In order to be counted, absentee ballots must be received by the close of the polls on the day of the Election Event. For more information regarding voting and elections, please click on one of the links below. The duties and responsibilities of the Registrars of Voters are dictated by the Connecticut General Statutes, Title 9, Chapters 141 - 158, Election Law. The Registrars of Voters follow the dates, statutes, notification requirements, guidelines, and procedures stipulated in the State Election Calendar to perform these duties and responsibilities which are three-pronged: to register voters; to maintain current and accurate voting lists; and to conduct elections and voting events in a uniform, consistent, and accessible manner. The Registrars of Voters are also subject to the provisions of the Freedom of Information Act with respect to record retention and public disclosure. The Registrars of Voters process registration and enrolment applications within statutory timeframes. Applications are reviewed, approved, filed, and processed through the State’s computerized system. Applicants are immediately included on voting lists and receive confirmation in writing of their voting status. 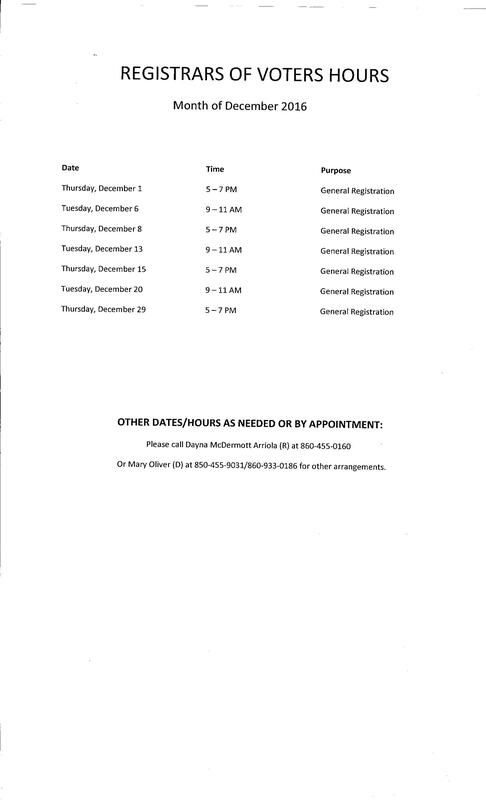 The Registrars schedule weekly registration sessions, as well as those sessions mandated by state statute, to process voter applications. Additionally, the Registrars conduct an annual registration session at the local high school. Regular registration sessions are posted at Town Hall and on the Town website, and mandated sessions are published in the local press. The Registrars of Voters are responsible for maintaining current and accurate voter lists. To that end, the Registrars are statutorily required to conduct an annual canvass in order to ascertain changes of residence. Registry and enrolment lists are amended as needed to include additions, changes, and removals. New voters are added to registry and enrolment lists as part of the registration process, lists are amended to include voter changes, and voters who have died, become disenfranchised, or confirmed in writing, or through notification from the Department of Motor Vehicles, a move out of town are immediately removed from the lists. A change detail report, which delineates additions, changes, and removals, is generated and filed electronically each month. In addition to the preliminary and final lists statutorily required prior to election events, voting lists are filed electronically and posted and supplied to the Town Clerk and the First Selectman monthly. Registry and enrolment lists are also available upon request to Town Chairmen, candidates, and campaign committees. The Town Clerk will collect a nominal fee established by the Town for all other requests for voting lists. The Registrars of Voters are responsible for conducting all elections and voting events in accordance with state statutes, regulations, and directives from the Office of the Secretary of State. Each Registrar is responsible for appointing and training a Deputy Registrar of Voters and Assistant Registrars as needed to fulfill required duties. The Registrars jointly recruit, appoint, and provide for training and certification of Moderators to serve in elections, primaries and referenda. The Registrars also apply the personnel policies developed for this purpose to recruit, appoint, and train a pool of official poll workers to serve during voting events. The Registrars are required to notify Town Committee Chairmen, candidates, and Political Action Committee Chairmen of their rights to request unofficial checkers for elections, primaries, and referenda, and may act upon such requests. The Registrars of Voters provide for the Moderators to conduct training sessions of all poll workers prior to all voting events. The Registrars also supply the Moderator and the poll workers with the materials necessary to perform their duties. It is the responsibility of the Registrars of Voters to secure polling places that accommodate ADA guidelines and to provide accessible voting procedures. The Registrars must equip polling places with supplies and must post information regarding voter rights and responsibilities. The Registrars must also provide ready access to every mechanism available in ascertaining voter eligibility at the polls. The Registrars of Voters also prepare for elections, primaries and referenda by noticing and conducting public sessions to test and prepare the tabulators and public lotteries for multiple office openings in municipal elections. After all elections, primaries and referenda, the Registrars must ascertain that tabulators are sealed and secured for a prescribed period of time determined by statute and that election materials are properly filed and stored. It is also the responsibility of the Registrars to record voter history in the State’s computerized system. Registrars must also conduct recanvasses when statutorily required and audits when mandated by the State. The Registrars of Voters provide Town Meetings with ballots, current and accurate registry lists, and grand lists, and assist the Moderator by facilitating the voting process and credentialing voters. The Registrars of Voters supply their respective Caucuses with current and accurate enrolment lists and assist Caucus Chairman by facilitating the voting process and credentialing voters. Following the Caucuses, each Registrar must provide primary petitions and instructions upon request to enrolled members of their respective parties and must formally receive, verify signatures, and certify primary petitions with the Town Clerk. The Registrars of Voters contribute to the Annual Report and prepare a department budget for the Board of Selectmen.